Contact us anytime with your questions or concerns. You can also leave a comment below. 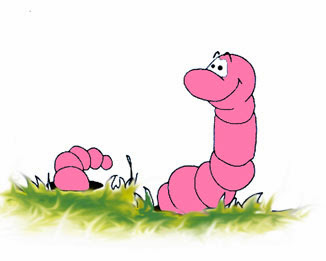 Earthworm Works: Information on red worms and European night crawlers; How-to-tips on growing, feeding, and care of earthworms. 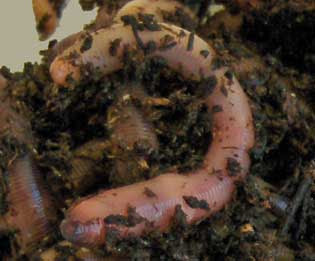 Buy Earthworms: Online store for red worms and European night crawlers. 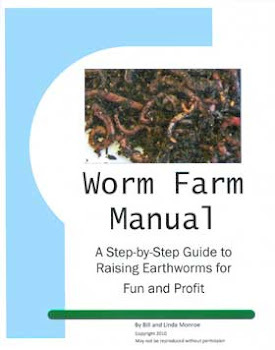 Get Started Worm Farming: My Worm Farm Manual gets you off to a good start. Oh, You say they are breeding. You should see little white egg capsules that gradually turn to reddish, then purple when ready to hatch. When hatched, there are little white strings for a day or so, then they turn red. Is your bed too crowded? How long since you've changed the bedding? Also, don't touch the egg capsules with your bare hands, the oils from your skin will make the capsules infertile. My euro's are doing great in their new peat/coir mix. I previously had issues with my first farm which was paper-based bedding and the worms died or got sick, but this is my first time :) In my new bin (made with healthy leftover worms from previous farm), 1 or 2 of the guys are seen coming out of the soil and turning right back into it like an archway. Read somewhere this could be an issue, but not sure. The bin is only about 7 in deep and 14 in across with 10 or so euros at 65 constant degrees give or take. Feeding them fresh fruit and veggie scraps and Frabill fat and sassy worm food once in a long while. They eat everything so quick, but also not sure if they are storing some and there may be food in their bedding from previous feedings. Really, just seeing if the arching is a concern and what it could likely be. Thanks! !